Portal is a puzzle-platform video game developed and published by Valve Corporation. (from Wikipedia) Portal consists primarily of a series of puzzles that must be solved by teleporting the player's character and simple objects using "the Aperture Science Handheld Portal Device", a device that can create inter-spatial portals between two flat planes. The player-character, Chell, is challenged and taunted by an artificial intelligence named GLaDOS (Genetic Lifeform and Disk Operating System) to complete each puzzle in the Aperture Science Enrichment Center using the portal gun with the promise of receiving cake when all the puzzles are completed. Portal, for the C64, was written by Myself, with Graphics by Del Seymour and Music by Roy Widding, all rights to the characters and storyline etc belong to Valve, this is purely a fan homage to such a great game. Portal, for the C64, was designed to feel like a modern PC game, and so was designed with mouse and keyboard as the control method of choice. 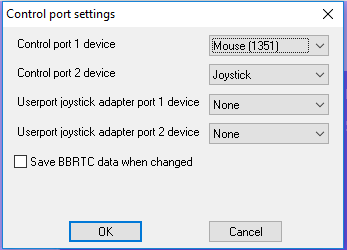 To play using a mouse you will need a 1351 Commodore Mouse (or compatible adapter etc) plugged into port 1. To play using a joystick, plug it into port 2. Either option you choose is purely to control the aiming, keyboard is always used to control Chell. 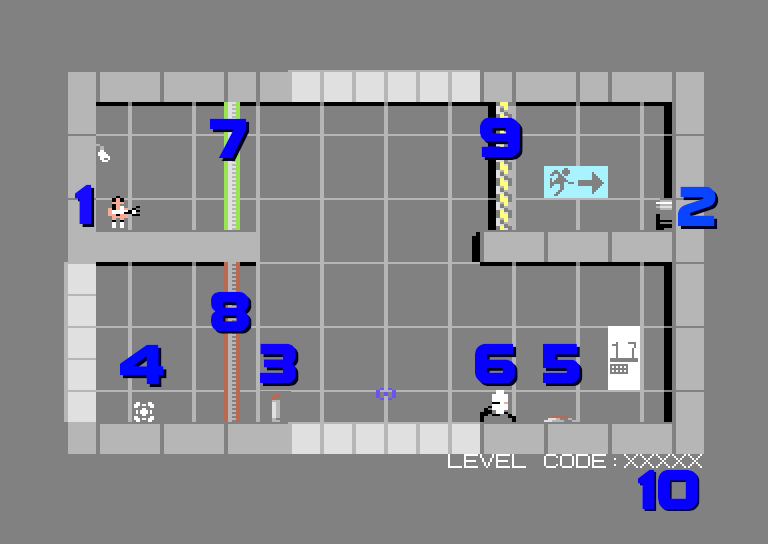 Navigate Chell (1) through each level, making your way to the exit point (2), there are a number of obsticles in your way and puzzles to solve, along the way you'll encounter switches (3) which will release your trusty companion cubes (4) you can use these to activate pads (5) which will open certain walls (9). they can also block the wayu of turrets (6) . there are also different kinds of walls, red ones (7) allow you to walk through but not shoot trough, green walls (8) can only be shot through, not walked through. GlaDOS will appear before every level to give some occasionally useful tips! And don't forget to keep a note of the level codes (10) so you can restart at that level next time you play. IMPORTANT: Portals can only materialise on the light grey blocks. 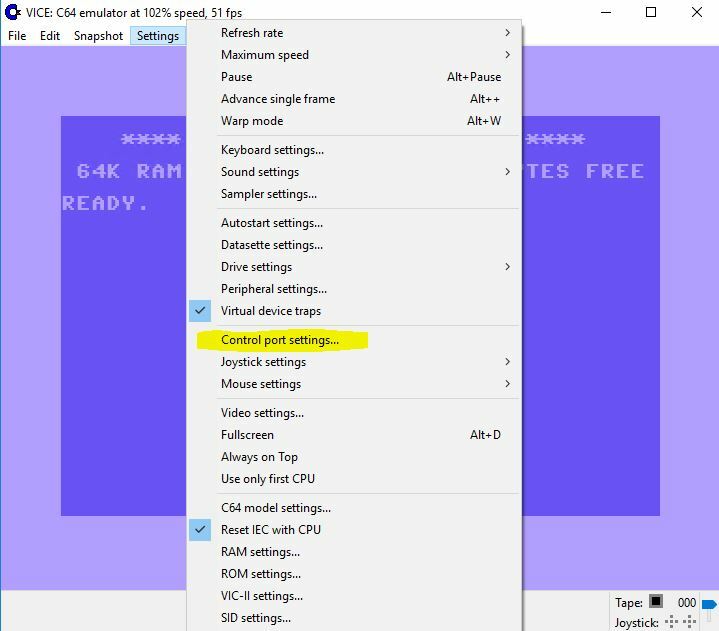 From the settings menu select "control port settings"
Then for "Control port 1 device" choose "Mouse (1351)"
IMPORTANT: When you are in VICE, you have to press "ALT+Q" to allow Vice to "capture" the mouse, pressing "ALT+Q" again will release the mouse back to the OS. All character/story rights belong to Valve. All my team-mates in MEGASTYLE for the advice, the testing and the feedback you gave. @AlessandroZecca, @Roysterini and Ian McCall whos donations of hardware will never be forgotten!